Share the post "Natural Mosquito Repellents – Plants, Which Keep Insects Away"
In summer we all want to stay outdoors as long as possible, to enjoy the garden, to walk in the parks, to run in the forest, to travel, admiring fresh herbs and blooming flowers. However, even the most beautiful vacation or just a free time can be ruined by the annoying mosquitoes. Mosquito bites can ruin the mood of the forest walks, can interfere with your ability to enjoy a lake view and make you think about nothing else, but how to escape. Of course the market today offers a large selection of different mosquito-repelling products: anti-mosquito creams, sprays, bracelets, fumigators, etc. But we don’t always want to use them, because of their chemical components. Especially when it comes to protecting a child. It is better to consider natural mosquito repellents. There are many plants, which scent repels mosquitoes. These plants can be planted in your garden, backyard, patio, or grown at the balcony. Mint, melissa, basil, rosemary, leaves and flowers of wild cherry contain essential oils and have a strong scent that mosquitoes don’t like. You can crush the leaves with your fingers and rub the juice on your skin. If you put bouquets of these plants in the room, they will clear it from mosquitoes. Geranium or Pelargonium plants will not only decorate your house or garden but can also be an effective tool against mosquitoes. Lavender is known as an excellent anti-moth herb, and this plant also helps to fight mosquitos. But, of course, you know, that its sweet scent attracts bees. Chamomile. Persian, Caucasian or Dalmatian daisy (aka pyrethrum) is an old folk remedy against mosquitoes. Put a few bouquets of these flowers around the house to keep mosquitos away. Even the scent of tomato leaves is bothering these annoying bloodsuckers. By growing tomatoes you are killing two birds with one stone: you get rid of mosquitoes and gather the harvest. Garlic has not only healing properties but it also helps to get rid of the insects. Just eat one clove of garlic before going out. 1. Put 5 grams of cloves into a glass of water, boil the water with cloves for 15 minutes. Mix 10 drops of the liquid with 1 tbsp. of any cologne and apply this mixture on the exposed areas of the body. Now, for two hours you are protected from mosquitoes and gnats. 2. Take 2 tablespoons of clove buds. Add 50ml of boiling water. Let it sit for a while. You can apply this mixture on the exposed areas of the body. If you add any alcohol to the mixture, it will enhance the effect. You can use anise seeds to prepare similar natural mosquito repellent mixtures. 3. Use clove essential oil. Apply just a couple of drops on the skin (it can be mixed with the vegetable oil 1:1). Anise, clove, basil, eucalyptus essential oils can help to keep mosquitoes away. 1. Prepare the mixture: 5-10 drops of one type of oil per one cup of water, and apply on the exposed areas of the skin. 2. You can also sprinkle the mixture on the fire, fireplace, aroma lamp or just on the preheated pan. 3. Use several drops of the essential oils on the cotton balls and place them on the windowsill. The smell of cedar oil repels not only mosquitoes but also flies and cockroaches. The smell of fresh elder branches repels mosquitoes. But be careful, the sharp smell of elder can ruin your sleep, so it is better not to keep it in your bedroom at night. In order to get rid of mosquitoes in the room, burn dry valerian or camphor over a candle or in a fireplace. If you decide to sit outdoors, throw into the fire juniper branches, nettles, pine branches and cones, or sagebrush. The smoke smell will repel mosquitos. Place a handful of chopped sagebrush roots into the pan and add 1,5 liters of water. Boil for 20-30 minutes. Wash your face, hands or legs with this decoction. Insects will not touch you. In ancient times people used a decoction of the bluegrass roots to repel mosquitoes and other blood-sucking insects. Place a handful of chopped bluegrass roots into the pan and add 1,5 liters of water. Boil it up to 3 times, so that the water becomes light yellow. Wash your face, hands or legs with this decoction. Insects will not touch you. Mix vanilla powder with baby cream in a ratio of 1:10, and apply to all exposed parts of the body. It is also possible to dissolve vanilla in water or alcohol (2 packs in 50ml), and then spray your skin with it. There are many ways to relieve itching, redness and swelling from mosquito bites. 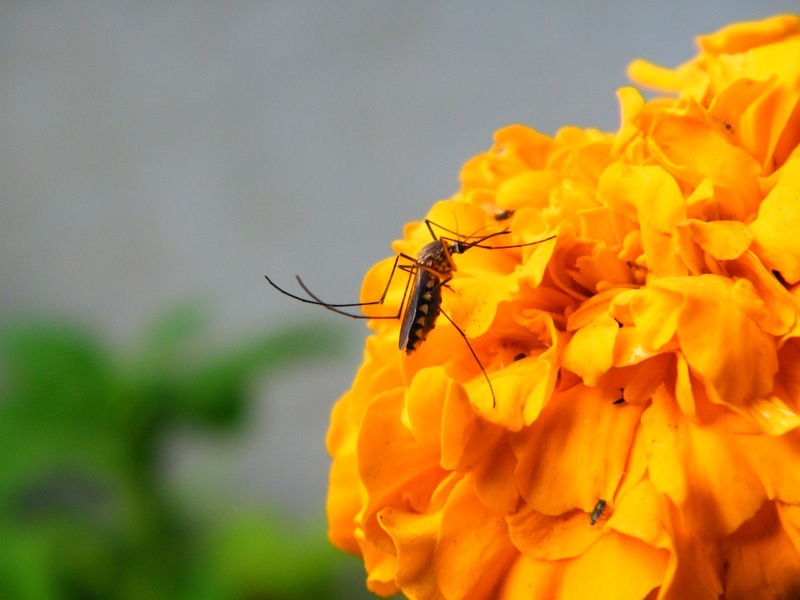 Fresh Tagetes, plantain, mint or parsley leaves juice can relieve itching and pain of the insect bites. Just make sure you wash the leaves of the herbs before using them. Dandelion juice helps to reduce itching and pain from the insects bites as well. Read more on our questions and answers page: Which plants can help to reduce itching and pain from insects bites? Please, NOTE: If you are allergic to any of the mentioned plants, don’t use them! Also REMEMBER, if the bites are accompanied by such alarming symptoms as severe swelling, a feeling of a “stone” and pain, severe itching and pustules, fever, you need to consult a doctor! If you know any other recipes of the natural mosquito repellents, please share in the comments below.